Why is setting photography pricing one of the most difficult business decisions to make? My experience of mentoring photographers has taught me that photography pricing is the single biggest thing that we all struggle with. However, once we establish some basic business truths the question ‘what am I worth’ becomes easier to answer. I have seen many of you struggle with the prospect of photography pricing because you don’t feel worthy but your photography talent is unique and valuable to your clients. If you don’t believe in your worth they certainly won’t. If you’re scared about charging too much at first, even simple pricing strategies can work: charging something is better than giving it away for free. With experience, you will want to develop more strategic photography pricing strategies that recognise your true value and reflect the market position that you are aiming for. Once you think you have matched yourself to your potential market you need to understand their motivations and purchasing behaviour and price yourself accordingly. 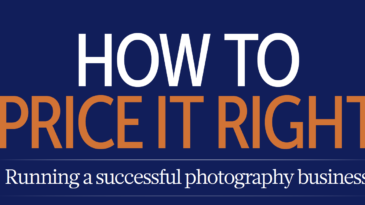 Photography is a huge industry with so many specialisms that it is difficult to discuss photography pricing strategies that will work across the board – from commercial to wedding to fine art photographers. Sadly, because there is also no industry-wide qualification that proves you are of a professional standard there is no single starting point for pricing your photographic work. If you’re just starting out an easy and effective pricing strategy has to be to charge what your time is worth and the most common pricing strategy for freelancers is an hourly rate. To do this you need to start with a realistic annual income figure, then calculate an achievable number of billable hours per week and how much time off your plan to take. This will then give you an hourly rate that will produce the required income BUT please remember that this is not your profit and still needs to be taxed and all direct and indirect costs taken into account. For the last 4 years, I have been charging an hourly rate for shooting, and an associated but lower, hourly rate for post-production. I then add a healthy mark up for any printed products that my clients might want. Many photographers don’t know where to start but Brent has developed an indispensable photography pricing calculator that will enable you to determine a billable hourly rate that will deliver your required turnover. This ability to forecast will ensure you launch a photography business with a clear understanding of what is required of you to be profitable and the expected associated costs of running your business (please consider getting in touch with us regarding some mentoring if you are struggling with pricing and hourly rates). Earning income in addition to your time will be specialism dependent – advertising photographers will need to take into consideration the end usage and purpose of the images whereas a fine art photographer might sell individual prints as a series with exclusivity put at a premium. Your sector of the industry will have ‘accepted’ pricing structures that are considered as being best practice. For example, the majority of portrait photographers tend to charge a small shoot fee and focus on upselling the final product (we are all familiar with the Venture model in some form or other). My experience of using this approach was frustrating with clients booking me who ultimately couldn’t actually afford me – in other words, my ‘up-sell’ pricing model wasn’t successfully positioning me in the market. All clients usually have a budget in mind and seek clarity in understanding what photography services will cost them and if there are any extras that need to be considered. In my posts that discuss branding and marketing, I have stated the importance of having a clearly defined target market and the impact this will have on your business. What your ideal clients are prepared to spend is a very different way of looking at pricing strategies. At its most simple, people who care about photography want the “best” they can afford and want value for money whether they represent the low end, mass market, premium or luxury consumers. If they don’t care about photography then they want the “cheapest”. Choosing ‘cheapest’ as your pricing strategy can deliver a relatively quick ‘win’ but you will soon learn that catering to the masses who don’t really care is a high volume, low margin model that becomes a race to the bottom. Someone will almost certainly be prepared to sell their photography cheaper – forcing you to lower your costs and/or quality to compete. When you are not being paid very much for your efforts you will, understandably, do the minimum required to meet your client’s expectations. This is exactly the market that the term ‘shoot and burn’ was created for. At the other end of the market, you have the luxury photography sector driven by high net worth individuals who expect the product to be of an incredibly high standard and beautifully presented. The significant margins that are charged on the products have to be manifested in the brand experience with a strong emphasis on exceptional customer service. Photographers earn more for working less but they have to deliver against their promises. With consumers, craving bargains or exclusivity the hardest market to compete in currently is the once solid and reliable mid-market. These are the consumers who are the most affected by rising taxes and living costs – any disposable income spend must exhibit value for money and competitive advantage. This translates to mean that photographers are competing on both price and product and will need to work hard to stand out of the crowd. That’s where branding comes in – it is one of the only things that will truly differentiate you in the marketplace. Each sector of the market represents a range of potential spend so be careful to not let over simplistic pricing strategies restrict the amount that clients invest in your photography. When I finally evolved from a set wedding fee to offering a choice of 3 ‘Collections’ it became clear that I been restricting the level of investment that was possible – I had fallen into the trap of pricing based on my perceived value rather than that of my clients. It was a real lesson to see how many clients booked my top collection at a premium rate because I was finally giving them the opportunity to spend more. I hope that I have helped you realise the particular importance of two factors when considering your pricing strategies: firstly to ensure that you are being paid for your time whilst covering your costs and secondly to position yourself in the market according to your target client’s purchasing power. Best of luck with developing a photography pricing plan that is relevant, competitive and built for the long term.